Saves countless hours typing @ and #, but the actual keyboard itself could use further refinement. 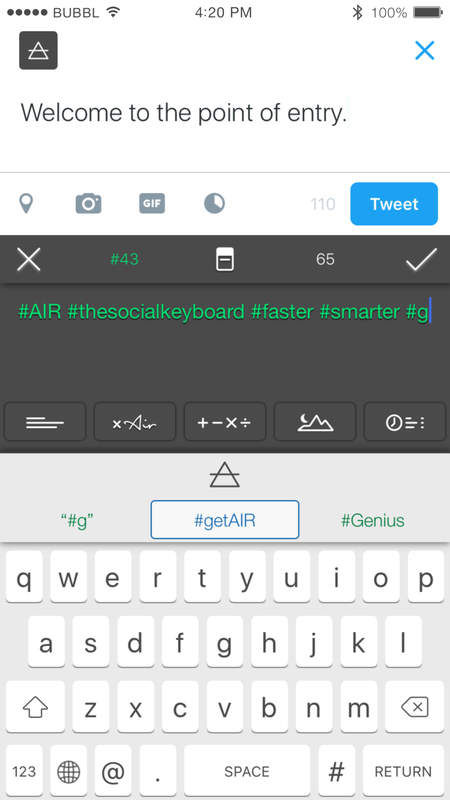 Air Social Keyboard is a full-featured app disguised as a keyboard, designed with social networking in mind. Ever since Apple opened the floodgates with iOS 8, a veritable tsunami of third-party keyboards has washed ashore in the App Store. Most are well-intentioned but ultimately too gimmicky to use every day, while a rare few actually wind up being good enough to replace Apple’s own. Air Social Keyboard (free with in-app purchases available) falls somewhere in-between, but has the potential to be truly great. The app connects with popular social networks, making it easier to compose posts prior to sharing from any app. The all-star lineup includes Facebook, Twitter, Instagram, LinkedIn, Tumblr, and Slack (sorry, Google+ fans), along with address book contacts. After connecting accounts and enabling the keyboard, Air resembles the stock Apple keyboard, with the exception of two symbols at either side: @ slides the keyboard aside to reveal contacts, while # displays recently-used and trending hashtags; either content can be added with a tap. Users can also select the appropriate key and begin typing to enable autocomplete suggestions. The main Air Social Keyboard app connects all of your social networks, manages content snippets, and much more. But it’s only after tapping the center Air icon that this full-featured keyboard really kicks into high gear: Twitter users can compose tweets longer than 140 characters, paste boilerplate text, use the built-in calculator, or create custom images with added text. With a $2 in-app purchase, users can also unlock Air Identity, which adds custom avatar, signature, and/or watermark options in place of the app default. It’s worth noting there are actually two different apps, one free with a light theme, another paid with dark. Make sure you purchase the right one, because upgrades can’t be ported from one to another. Air Image Editor is easily the most fascinating feature: After typing a short message with the keyboard, select an image from your device library and text appears superimposed on top of it. Tap to edit properties like font style, size, justification, shadow, and color, or relocate text to the top, center, or bottom with your finger. 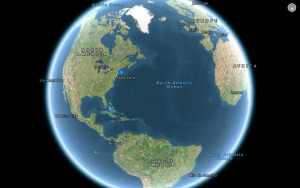 Imported images can be cropped to predefined sizes, including a few tailored specifically to Facebook and Twitter. 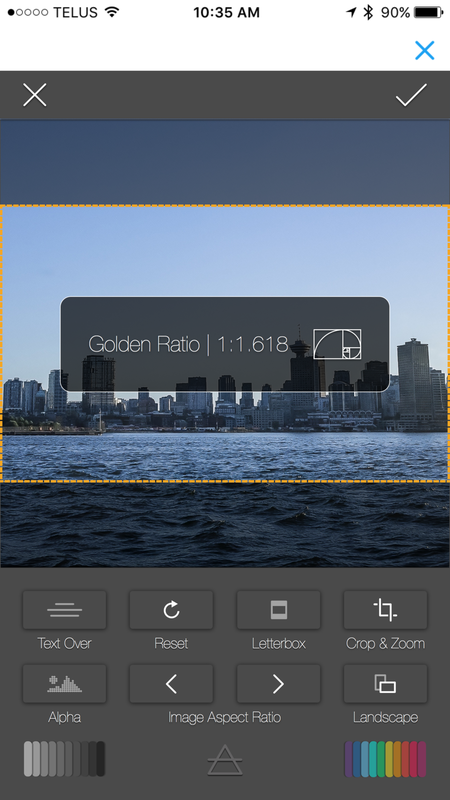 You’ll also have the option to crop images to predefined sizes, zoom, reposition, or adjust opacity. Edited images are saved to the camera roll, where they can be uploaded from any social networking app. 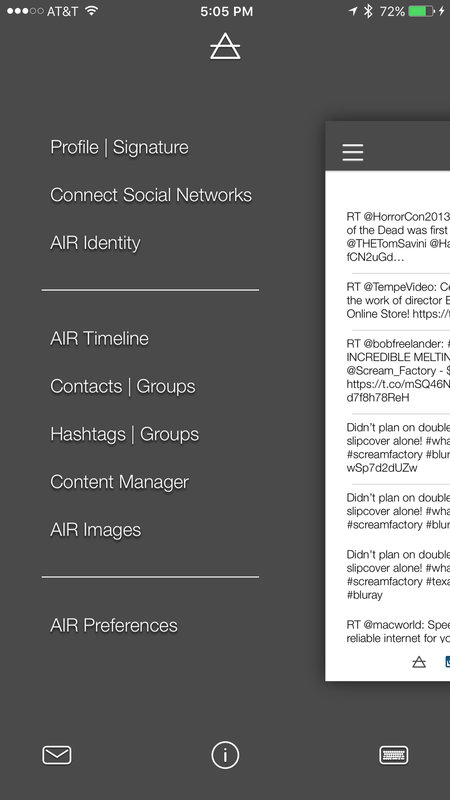 Because Air maintains a timeline of your posts, it’s easy to reuse content in a few taps. While there’s no denying Air’s convenience and power, as a keyboard it’s just okay. I’m the type of person who depends on those comforting audible taps while typing, and AIR is deadly silent; all you’ll hear is the sound of your fingertips tapping glass. The numeric keypad has a unique layout with vertical digits in the center, which also takes some getting used to. Although it’s fair to say most third-party keyboards are finicky (which is not always the fault of developers), Air’s overstuffed suite of features seems to make it even more prone to instability. On-screen text failed to properly refresh after changing the justification, or the entire keyboard would occasionally crash, even on my iPhone 6s Plus with plenty of memory. If you live and breathe social networking, Air Social Keyboard saves countless hours typing @ and #, but the actual keyboard itself could use further refinement. Featuring a built-in image editor and more, Air Social is a third-party keyboard for iPhone that makes contacts and social networking content available from every app on your device.